In my previous job, I spent 15 years delivering lectures and conducting research in the field of preventative health and well-being. Much of this work was underpinned by the basic premise of energy expenditure attributed to weight loss and weight maintenance, and the simple argument of ‘calories in, calories out’. The mantra supporting this argument was ‘individual’s must expend what they intake’. As a consequence, numerous interventions were conducted and published to create an evidence base that advocated calorie restriction and increasing physical activity and exercise. Indeed, weight loss programmes and physical activity/exercise promotion that followed were based on these assumptions, meaning the individuals who undertook these programmes were educated through calories only and not guided on the importance of balancing macronutrients and intaking foods that provide a range of vitamins, minerals and phytonutrients. Since studying Nutrition at master’s level, and qualifying as a Nutritional Therapist, I’ve indulged in a new raft of evidence that challenges the calories in calories out argument, and focuses on what is eaten, as well as when its being eaten. 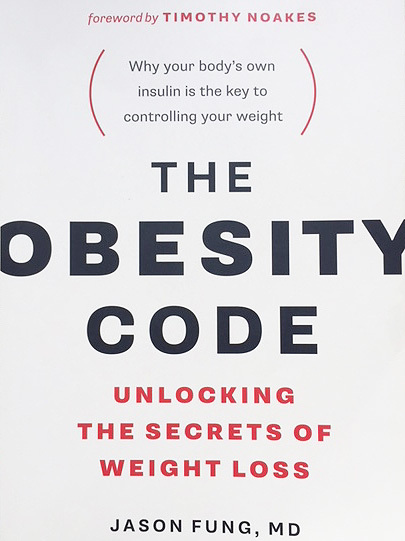 This notion is outlined with precision and accuracy in the very brilliant ‘The Obesity Code’ by Jason Fung, which I read recently. In challenging the calories argument, Fung does not completely dispute calories as unimportant per se, of course you can’t just eat and eat, be sedentary and expect to stay slim. Notwithstanding this, Fung argues the problem with weight gain and obesity, is the foods we are eating and the impact of these foods on our hormones and other physiological mechanisms once we digest them. Not surprisingly, the main culprits are: sugar, refined carbohydrates (note: if you’ve read my sugar blog you’ll already be aware of this), and the hormone inextricably linked to sugar intake, insulin. In terms of practice, the book provides a comprehensive guide of tips and strategies that we as professionals can impart to our clients. First, the focus on food: its best to minimise refined sugars and carbohydrates, and increase intake of wholefoods, fibre, good fats, lean protein, and so on. Second, the focus on when to eat: intermittent fasting is recommended, as this is a way of eating that for most people will support and stabilise blood sugar. People should also refrain from snacking, because this raises insulin. Third, and finally, the importance of stress management. Cortisol, the stress hormone, and elevated levels of cortisol over a sustained period of time, are associated with weight gain, because raised cortisol also raises insulin. Dealing with and managing stress is as important as dietary modification and patterns of eating. In summary, it’s this combination of behavioural factors – what you’re eating, when you’re eating and how stressed you are – that impacts on hormone balance and the physiological mechanisms that control weight. So, weight management is not a simple calories in/calories out equation, it is much more complex than that. We need people to move away from programmes, apps and other forms of weight management that promote this philosophy and the ‘quick fix’ approach and educate people according to the obesity code. Fung, J. (2016) The Obesity Code. Greystone Books, British Columbia.